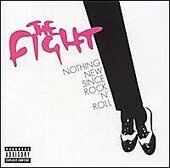 The Fight is a U.K. based, female fronted punk rock outfit who've been generating a buzz, thanks in part to the quartet's 14-track release that sounds like a hybrid version of The Runaways meet No Doubt. Songs like "Forgotten Generation" and "Mommy's Little Soldier" are by the book punk rock songs that lack the bite of The Distillers but have all the hooks of anything currently on top of the charts. While The Fight aren't a band that will change the landscape of punk rock, they provide a solid shot of catchy, hook-laden tunes that should appeal to those who've outgrown Avirl Levigne.